My Muse returned just in time! My Mom recently renovated her bathroom. A couple weeks ago she told me she has never asked for anything specific for her birthday gift, but could I please paint her a “Seascape” painting for her birthday. 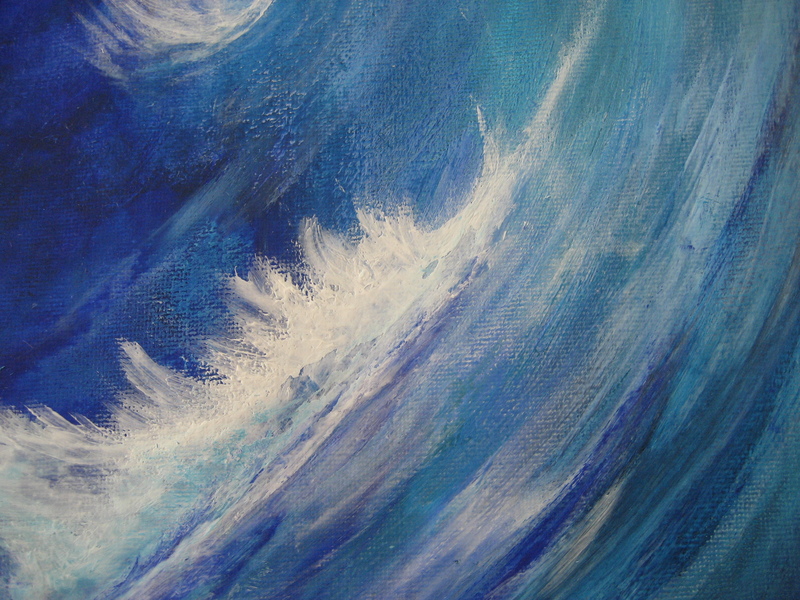 She loved the “Seascape” paintings I had made for Shannon Raelynn’s book launch, and was now wanting one for herself. Well, with my Mom’s birthday looming (it is tomorrow Oct. 1st), I hauled out the paints, a 24″ x 12″ canvas on Saturday, and had at ‘er! It was slow going to begin with , a couple times I was ready to pack it in. At one point I got upset, not satisfied with my progress and wiped down the entire canvas with a damp rag. I began to see some potential in what I had done thus far. My Muse appeared just in the nick of time; several hours later I decided I had my best painting thus far. 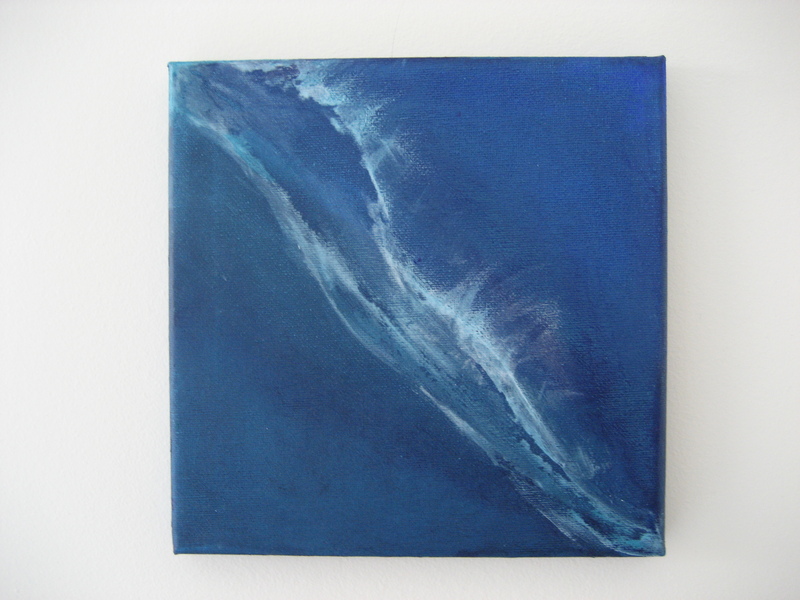 Happy Birthday, Mom, “Seascape III” is all yours! I often hear friends and family say they would love to paint, write, or engage in other artistic pursuits if they had the time. I must admit I felt the same way for most of my life. About a year ago I realized that if I did not start engaging in the artistic endeavors I desired to be part of my life, I might not ever get the chance. It occurred to me if I was waiting for a big chunk of time to begin writing or painting, that day could be long in coming, if ever. The perfect time was never going to arrive. I decided to steal moments here and there as I could to jot tiny snippets of memoir down, start or finish poems, even paint small paintings, sometimes while making dinner in between stirring a pot of sauce and pasta. Finally giving myself permission to engage in these activities (even for 15 minutes at a time) provided a sense of well-being. The pleasure of allowing myself the chance to express myself and actually do something I longed for was immensely gratifying. 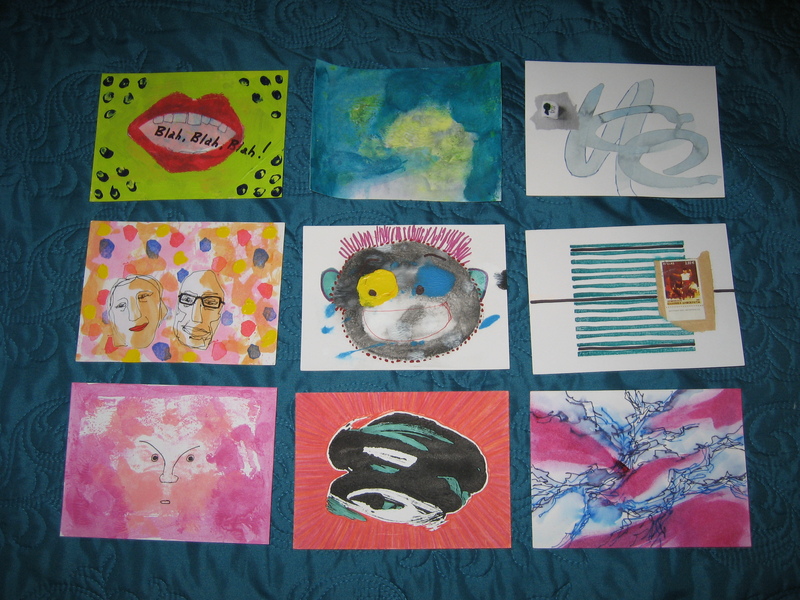 If you want to dabble with some art in quick stolen moments…try getting some 4×6 or 5×7 little canvases and acrylic paints, or some paper and watercolors and make 5 minute paintings…..or buy yourself a beautiful journal to write 15 minute little poems, snippets of stories, moments of memoir…you may surprise yourself! After being in a creative funk for several weeks, today I remembered just the right size project to ease me back into the creative world. Several weeks ago, I discovered a blog here at WordPress that belongs to a lady, Katerina, in the Netherlands who has a visual art experiment underway. I was intrigued. I contacted her right away to become a tiny part of “Receive, Create, Combine”. 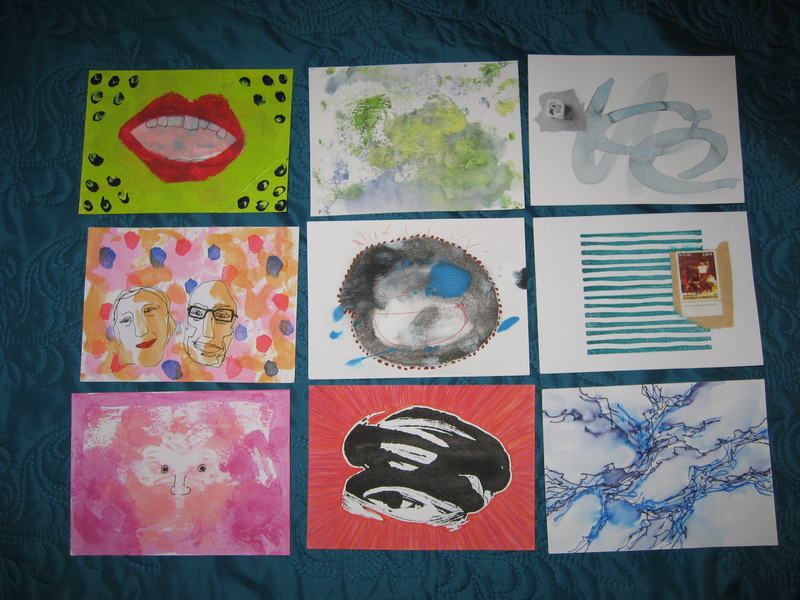 I received a set of 9 postcard size pieces of art in the mail, that had been started by 1-3 other individuals thus far. A card is complete when 8 people have added to it. Looking forward to seeing the cards once the remainder of the “artists” have added their personal touches. Thanks Katerina for the “spark” I needed! Just over fourteen years ago I met a kindred spirit, my dear friend Shannon. We met while working for a family services organization. Little did we know at the time, we would become very close friends sharing an intense common passion. Beside our friendship and mutual respect for each other, we discovered that we shared a love for writing. Both Shannon and I resigned from our jobs on the same day in 2001, celebrating our final day of work together a few weeks later. Very shortly afterward she began writing her first novel, which ended up being a twelve year process, in between helping her husband with his business, having another child, and parenting responsibilities. During this same time frame, I ventured to the city to take the occasional writing workshop, dabbling with poetry and short stories. Serendipity! Synchronicity! 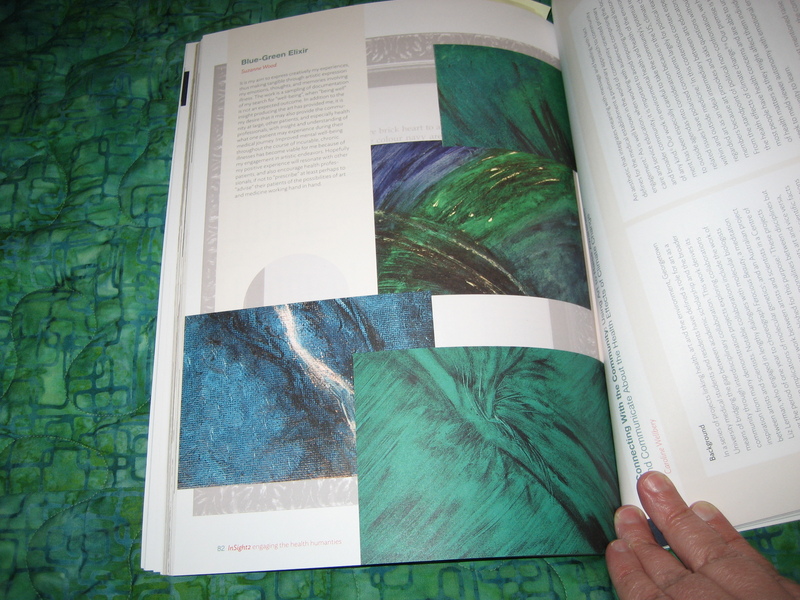 Within a few days of Shannon publishing her first book this Spring, the one she began so many years earlier, I discovered that for the first time ever I would have poems/ paintings exhibited, as well as a short creative non-fiction piece published in an anthology. I don’t think you could find two friends more ecstatic for each other. We never imagined we would celebrate being published authors together! In celebration of Shannon’s novel “Seascape”. 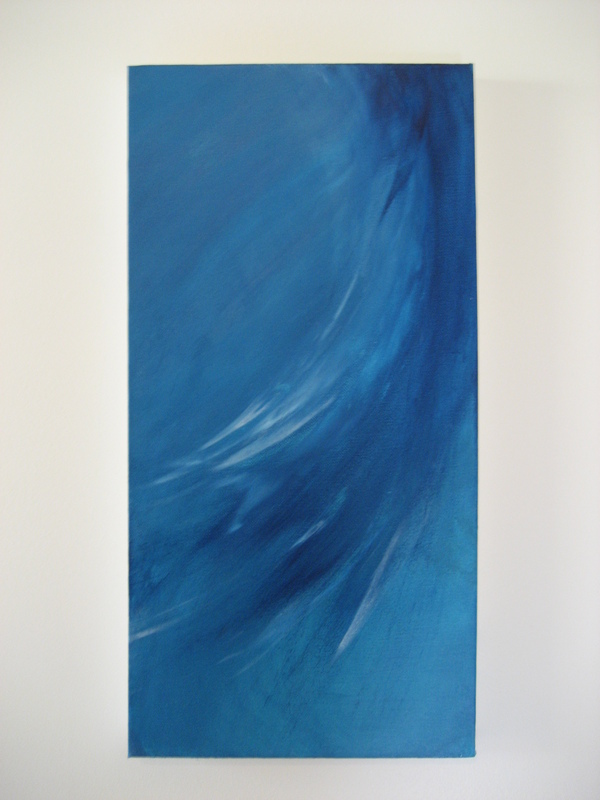 I painted two abstract paintings for her – “Seascape” (above) and “Seascape II”. One was a door prize at her book launch. I call it the “Pay It Forward Painting” because it was won by another friend of Shannon’s who worked diligently to prepare the launch party. The second painting is in Shannon’s office / writing room. A few weeks back I mentioned that I would let you in on a secret about my paintings. The secret is: I paint them using my hands, not a brush! Shannon is now hard at work on her second novel….and no, this one will not take twelve years to write she assures us. I am working on gathering a bunch of poems I have written over the last few years to edit, and will continue to “fingerpaint”. We will continue to celebrate together. It’s REAL! My first exhibit / publication! 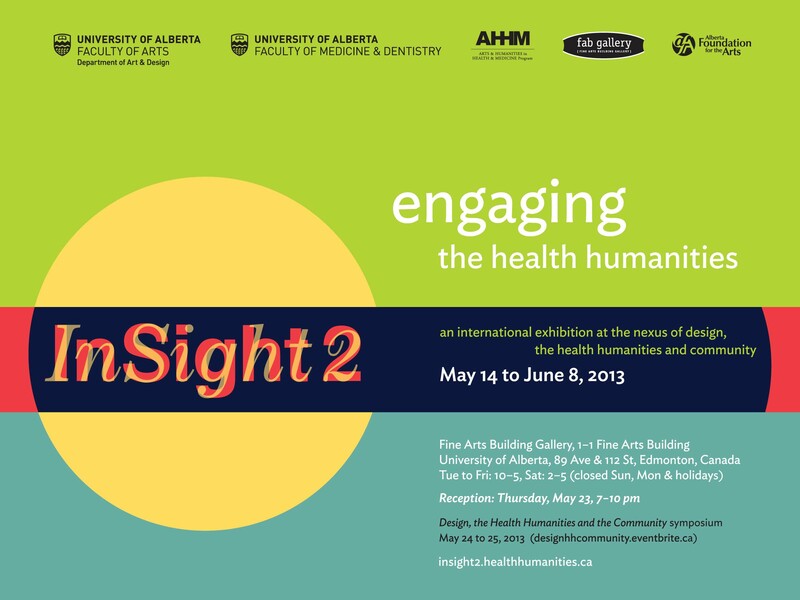 Ventured to Edmonton with one of my sons on Thursday evening to attend the opening reception of the InSight 2 – Engaging the Health Humanities International Exhibition. So exciting to see my paintings and poems displayed alongside so many other intriguing exhibits by talented artists and health professionals. When we first arrived, we wandered though the UofA (Fine Arts Building) FAB Gallery viewing all the work, but admittedly my eye was on the look out for my exhibit. I was a little panicked when I thought we’d been through it all and I could not find my paintings / poems, then I remembered we had not been to the very first area near the entrance…..sure enough they they were! Whew. For a minute or two I did think it really all had been just a dream! 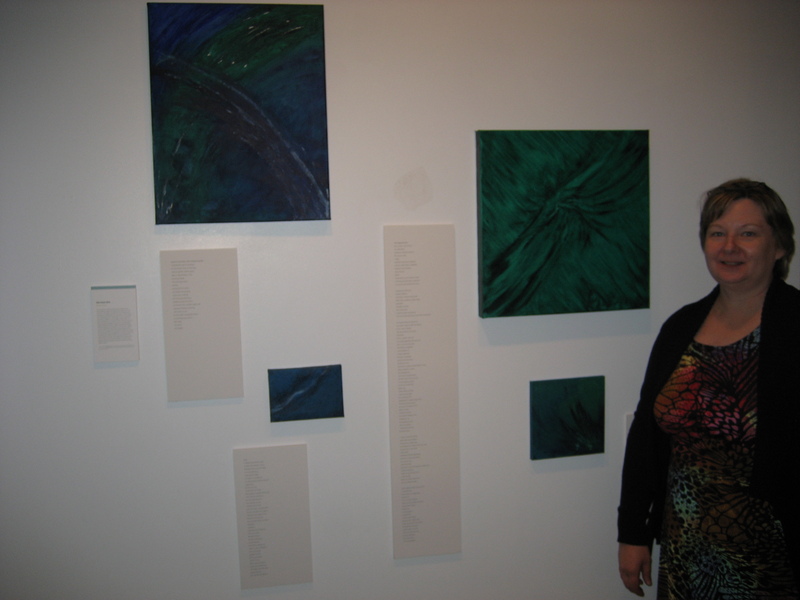 I was so grateful to be able to attend the reception to see my “Blue-Green Elixir” up on the FAB Gallery wall, being visited by fellow artists, writers, doctors, health professionals, students, and the public at large. Thank you so much to Graeme for ensuring I made it to the reception, and Shannon who was very much with me in spirit every step of the way! Love you both for knowing how important this was to me, without me having to tell you! 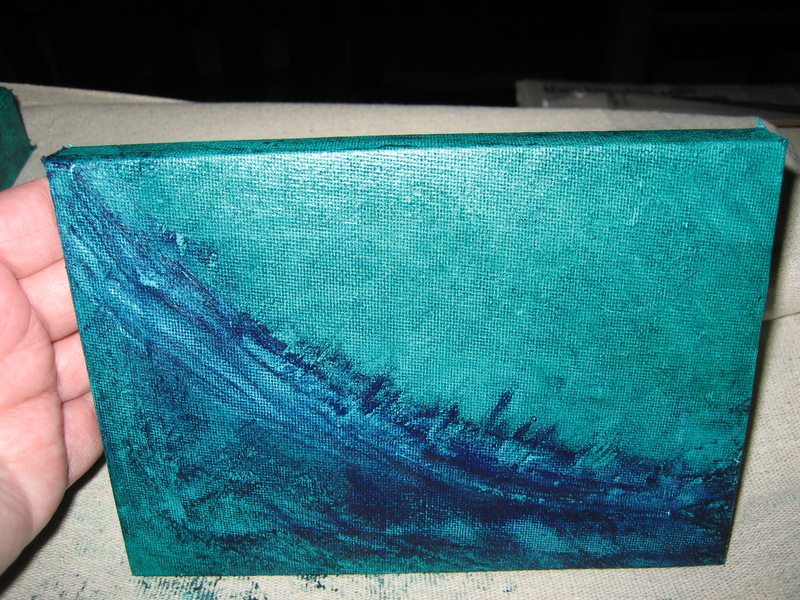 “Blue-Green Elixir” is rough, amateur painting, as well as poems that are far from literary masterpieces. I have no delusions that they would be chosen for any other type of juried art show or literary anthology. It is however, my sincere hope that they may inspire others who suffer from illness or lack of well-being of any sort, to at least give art a try. Living in a rural area, hours away from a city, the option of attending a formal “Arts in Medicine” program, visiting a psychologist specializing in art therapy, or an “Artist in Residence” at a major hospital is usually not a viable option. At times the very nature of one’s illness may prohibit travel and engagement due to mobility issues, fatigue, concentration issues and so forth. For many patients not having ready access to arts / humanities programs presents a barrier to becoming engaged in experiences that could promote improved health and well-being. It was my good fortune to stumble upon on-line writing classes through the University of Alberta Faculty of Extension that are taught by Reinekke Lengelle, a former writer in residence at the University of Alberta Hospital. The on-line delivery allows an individual to work on their projects when they feel best, ready to engage with their learning community. In addition to the discovery that the very act of writing itself is indeed “good medicine”, the creative writing courses allowed me the opportunity to develop on-going relationships with others not just coping with illness, but thriving creatively in spite of it! “Blue-Green Elixir” was chosen as the title of my exhibit due to my recent experience at a weekend painting workshop given by artist Rose-Marie Cameron. 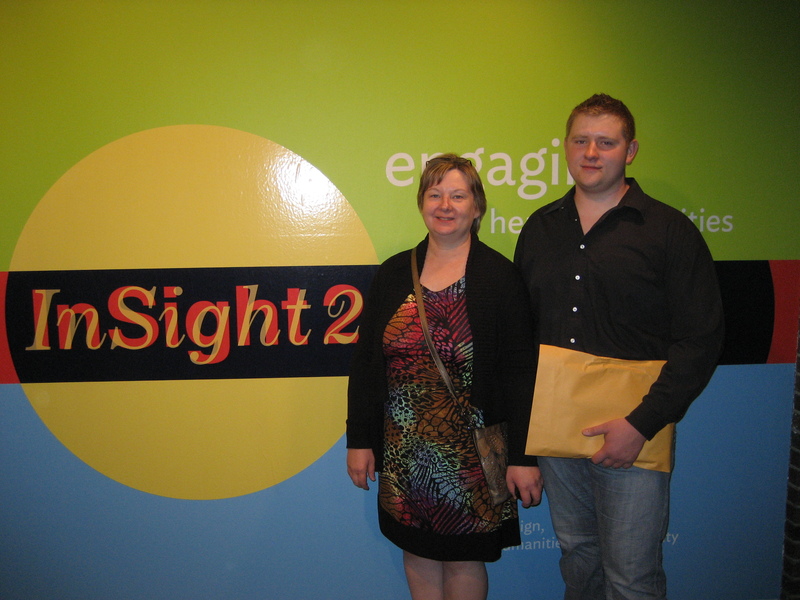 It was an event open to the general public, and one that I had long hoped to participate in. On the second day of the workshop, one of the other participants asked me if I realized I was always using blue and green in my paintings. I told her I had tried the reds and yellows but they left me ill at ease; I craved blues and greens. I did not explain further. I had discovered that the blue – green colors as much as the creative process itself, were soothing and calming me, lessening my symptoms. I have learned that the blank page or canvas can be witness to my anxiety, grief, and pain, lessening my symptoms and easing my mind. Colors can soothe, words can heal. 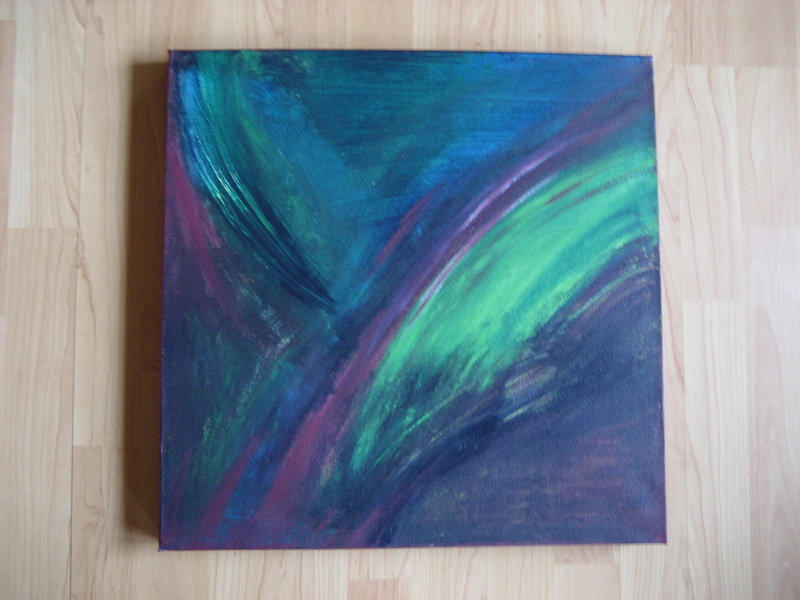 Painting above, “Blue-Green Elixir”, is actually not in the exhibit because the canvas was damaged. Thought I’d give you a peek of my work. Next post I will reveal a secret about my “technique” that may surprise you! 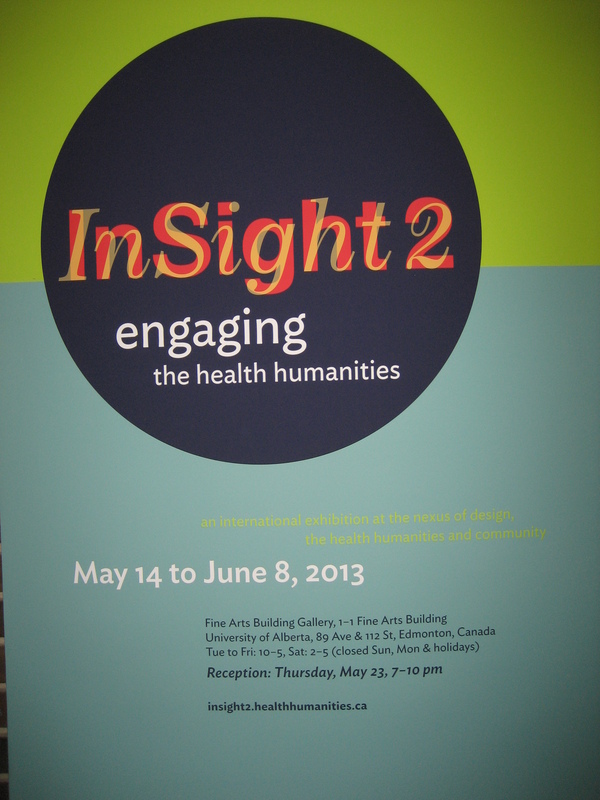 “Blue-Green Elixir” at InSight2 starting May 14, 2013! “Blue-Green Elixir” It is my aim to express creatively my experiences, thus making tangible through artistic expression my emotions, thoughts, and memories involving illness. The work is a sampling of documentation of my search for “well-being”, when “being well” is not an expected outcome. In addition to the insight producing the art has provided me, it is my desire that it may also provide the community at large, other patients, and especially health professionals, with insight and understanding of what one patient may experience during their medical journey. Improved mental well-being throughout the course of incurable, chronic illnesses has become viable for me because of my engagement in artistic endeavors. Hopefully my positive experience will resonate with other patients, and also encourage health professionals, if not to “prescribe” at least perhaps to “advise” their patients of the possibilities of art and medicine working hand in hand.